The "Chrome At'Home" method gives the means to achieve easily and quickly chrome plating, in the garage or in the garden, without equipment or machine, on any type of support! Professional systems are described on our website. Chrome plating comprises several consecutive steps of spraying, and involves a non-hazardous chemical reaction (product not listed as carcinogenic, contains no heavy metals). Can be implemented on any type of surface, once the substrate has been correctly prepared (cleaning, degreasing, sanding, applying an adhesion primer if necessary). This first preparation of the part to be painted is done in accordance with painting's proper rules. 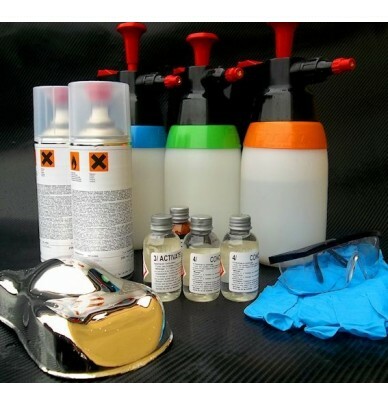 To ensure that the silver plating reaction is effective, it is necessary that the weather conditions best meet these guidelines: >20°C for the temperature of the ambient air in the workshop, for the temperature of the mixture (water + products) and for the surface of the structure to be chromed. If the temperature remains below 15°C, the reaction will be slowed down and will not give the desired results. The higher the temperature, the more satisfactory the results will be and the expenditure on products will decrease. 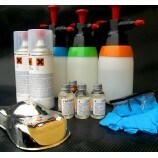 - Each bottle must be perfectly clean, no residue should be present. Do not contaminate the various liquids together! - Prepare in advance all products thinned in bottles: The different phases must be carried out one after another, without interruption. - Pressurize the 3 pump sprayers, by pumping 60 times. Do not get too much liquid in the pumps: The more the liquid is present, the less air to pressurize. - Wear goggles during each step, and beware against accidental spraying in the eyes. - Undercoat and final topcoat applications should take place in a booth, in a well ventilated area or outdoors. 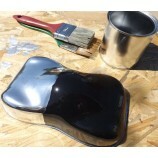 Chrome At'Home Complete Kits include special aerosol undercoat. Caution: Undercoat and final topcoat applications should take place in a booth, in a well ventilated area or outdoors. Harmful and flammable product. Respect the safety instructions. Trigger the hardener at the bottom of the can, press several times. Then shake the can vigorously for 30 seconds. Aerosol service life: 1 hour max. It is very important to obtain a very smooth and glossy paint. Take the piece to be painted and which is clean and finely sanded, and spray over it a first very thin pass of paint, to "create adherence". After 2-5 minutes, apply the final pass, thick and very wet, to create a glossy surface. Tip: If the coat is too thin, the paint will not be glossy. If the layer is too thick, you will get drips. Drying: Leave the part to dry 24-48 hours in a place protected from moisture, cold and dust. After drying: Do not touch the part with fingers. It should not be sanded or degreased. Mixture: Inside a clean and empty spray bottle, mix 30-60g of concentrated wetting agent with 500g of demineralised water. Spray all over the part including all hidden recesses and leave for 10 seconds. Rinse with the pump sprayer filled with demineralised water. Observe the surface of the painted part: It should be completely wet and the water should not form beads on the surface. If dry zones appear on the surface of the paint, repeat the process by re-applying the wetting agent, and then rinse again. Wear safety goggles. Product is irritating to the eyes. Mixture: Inside a clean and empty spray bottle, mix 1,3ml (1,3g) of concentrated activator with 500g (500ml) of demineralised water. Spray all over the part including all hidden recesses and leave for 5-10 seconds. Never let dry. Rinse twice with the pump sprayer filled with demineralised water. To prevent stains, any trace of activator must be removed before starting the next step. Wear safety goggles. Product is irritating to the eyes. Wear protective gloves and clothing: the product can leave stains! Do not breathe vapors or wear a respirator: the final product contains less than 0.5% of ammonia. Solution A: Inside the pump sprayer A: Add 250ml of demineralized water, then 20ml of A1 (ref CD2920, 20ml = 19,25g), then 10ml of A2 (ref OX1910, 10ml = 12g), then complete with 250ml of demineralized water. Solution B: Inside the pump sprayer B: Add 250ml of demineralized water, then 10ml of B1 (ref CD1900, 10ml = 12,2g), then 10ml of B2 (ref RED5910, 10Ml = 10,7g), then complete with 250ml of demineralised water. Spray simultaneously the 2 products over the part to be painted. 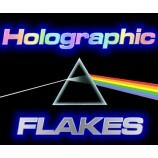 The reaction should occur within 10 to 60 seconds. Keep on spraying to ensure a good metallised coat Then rinse the part and blow-dry. Drying: 1.5h at 20 °C or 40 minutes at 35 °C. Then go to Phase 5: clearcoating. 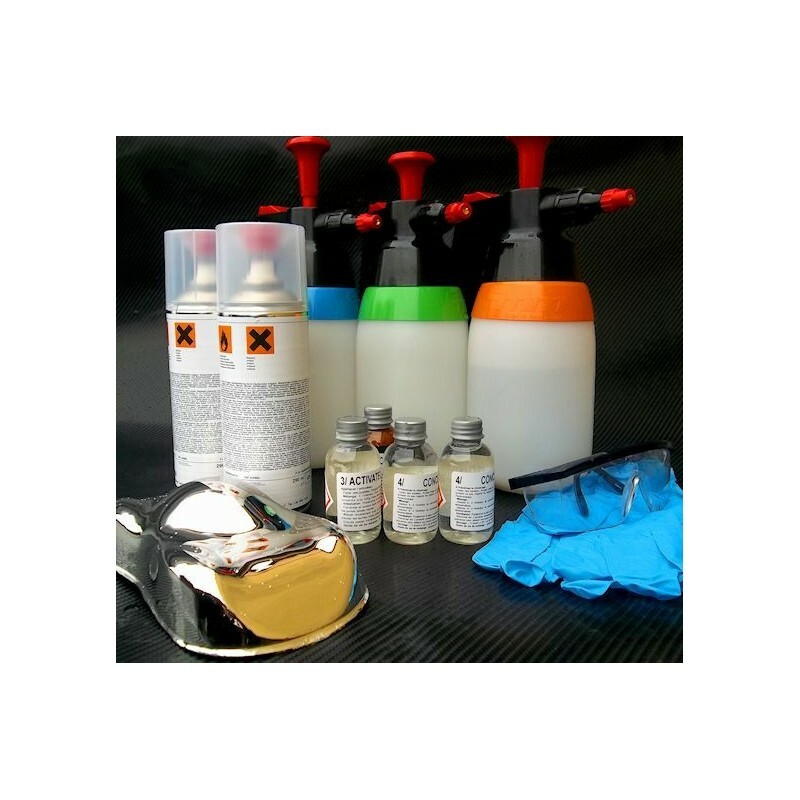 CAH 2K clearcoat is the only recommended product to achieve a direct adhesion on the chrome plating, and a protection against yellowing. Spray a first thin pass of topcoat to "create adherence". After 2-5 minutes, apply a second pass, to produce a glossy surface. After complete drying, the clearcoat can be sanded lightly and a highly resistant automotive topcoat can be applied over it. Harmful and flammable products. Respect the safety instructions. Wear a respirator and work in a well ventilated area. The Chrome At'Home offer is available in different versions. - Apply generously the wetting agent and rinse without insisting. In case dry zones still remain, repeat the process as many times as necessary. - Apply the activator without delay, immediately after rinsing, and as quickly as possible over the entire surface. Always rinse each stage (except the wetting agent), if necessary with a gun, especially in the corners. Rinse also supports and hooks. 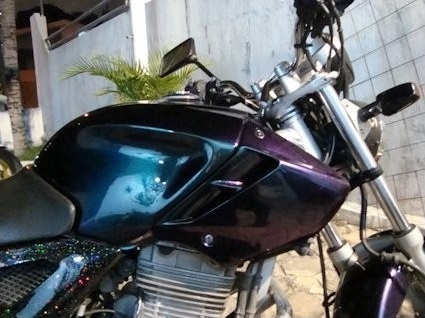 Do not try to chroming larger pieces a helmet: the size of the spray does not allow it. - 3 empty 1000ml pump sprayers with coloured rings. 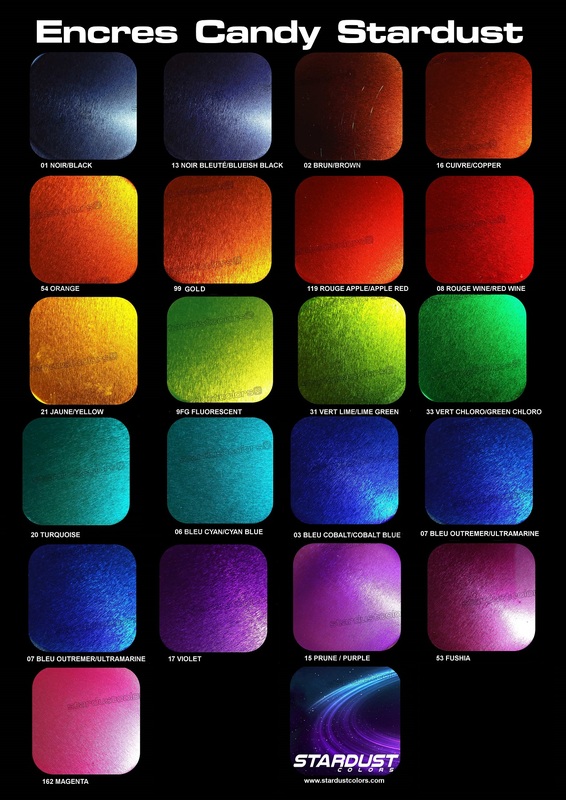 Colour can easily be added to chrome plating using our coloured topcoats (included in the kits - coloured version). 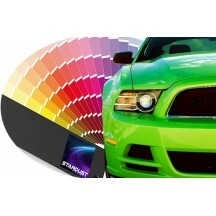 Available colours: purple, cobalt blue, cyan, chlorophyll green, lime green, gold, orange, red. 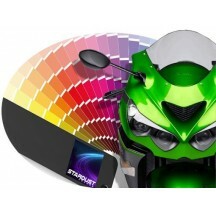 To order a colour, simply precise the desired colour in the comments box. Return rates shown are approximate. They depend on the number of passes applied. The temperature of water, of the part to be painted and of air between 25 and 45 °C can improve the efficiency and reduce product consumption. It is very important to collect waste water in a container. Dispose of waste material as hazardous products at the waste depot site. Never discard waste into sewers. These products can pollute water and disrupt the operation of treatment centers. Risk of explosion! Always keep the concentrated solution A away from heat and light. Do not allow the product to evaporate completely and rinse the empty bottle. Do not mix product A and B together. Respect the safety instructions and store out of the reach of children! · Always thoroughly rinse at each stage (except when applying the wetting agent), if necessary with a spray gun, especially in all the corners. Rinse also supports and hooks. 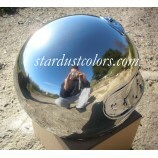 · Do not attempt chroming pieces larger that an helmet: the size of the sprayers does not allow it.